This horse was owned by Mr. E. Caspari who commissioned the painter Georges Busson to record his horse with jockey and trainer after their victory in the Prix Ventriloque. This is an important hurdle race over 35oo meter in March, which still is an annual event on the race course of Auteuil in Paris. In 2014 the first prize money was 48.000 euro. The artist annotated his work with the details of this race. The jockey was George Mitchell and the horse was trained by Charles Defeyer. 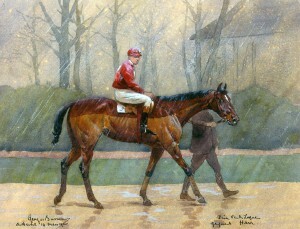 A particular trait of this painting is the rain, which makes this painting stand out among most other horse portraits. Moreover the rain will have made the race very heavy and the victory of Harr even more worthwhile. One can imagine that horse and rider are exhausted, but both look aside to the spot where the painter has taken his position. 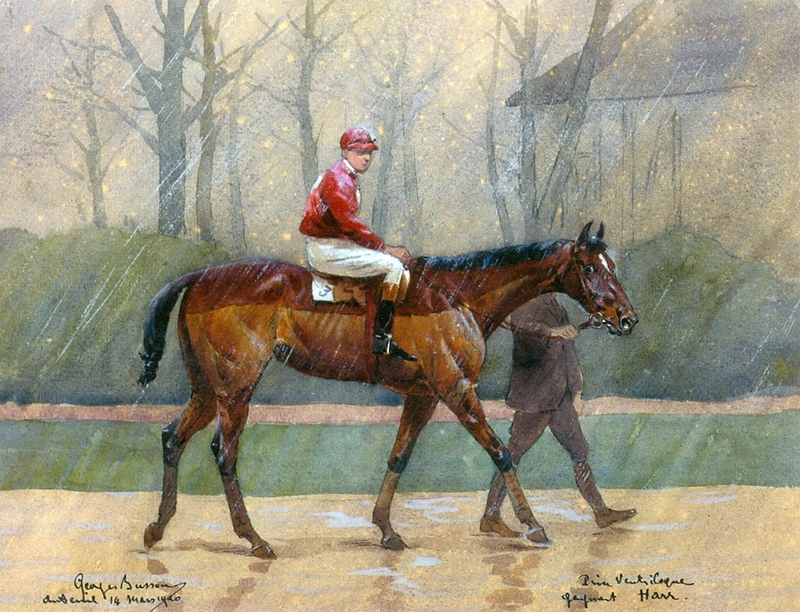 Among the numerous portraits of race horses after their victory, this one is very characteristic because of the rain and the personal look of the jockey and his horse. Their interest in the painter is aroused, even when they are tired and like to go to the stable as soon as possible.